The Telangana legislative assembly was dissolved in September, more than 10 months before the expiry of its term, giving way to early elections. K Chandrasekhar Rao hopes to achieve a thumping victory this time too. Telangana will witness a three-cornered battle as it goes to the polls for the second time today, with the Telangana Rashtra Samithi (TRS), BJP and a grand alliance led by the Congress and Telugu Desam Party (TDP) vying for power. As many as 48,000 police personnel and 290 companies of the Central Armed Forces have been pressed into election duty to ensure free-and-fair polls in the country's youngest state. The Telangana legislative assembly was dissolved in September, over eight months before the expiry of its term, giving way to early elections. While the BJP and Asaduddin Owaisi's All India Majlis-e-Ittehad-ul Muslimeen (AIMIM) hope to make a mark in this election, the grand alliance is expected to be the TRS' main opponent for administrative control over the state. The previous assembly elections were held soon after Telangana was carved out of Andhra Pradesh in June 2014. 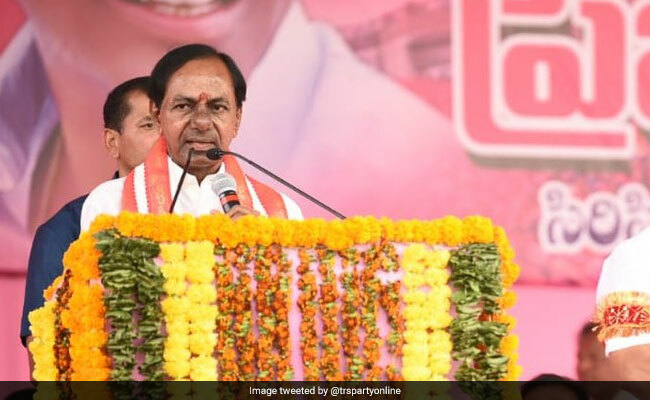 Back then, TRS chief K Chandrasekhar Rao had led his party to a decisive victory -- winning 63 seats out of 119 with a vote share of 34 per cent. In the years that followed, the regional party managed to lure legislators from opposition ranks until its seat share rose to a formidable 90. Mr Rao hopes to achieve similar success this time. It is believed that his decision to dissolve the assembly early was aimed at taking up the electoral challenge while he still holds the people's favour. Over 1.6 lakh election officials have been deployed in the state to ensure that no difficulties are experienced when an expected 2.8 crore people arrive to vote between 8 am and 5 pm. The Election Commission has set up 33,000 polling stations across 31 districts of the state. A total of 1,821 candidates, including 135 women, are in the fray. The results will be declared on December 11, along with that of Chhattisgarh, Rajasthan Madhya Pradesh and Mizoram.